The National Laboratory Association – South Africa (NLA-SA) is a representative body that evolved from the previous National Laboratory Accreditation service. Following the assumption of overall responsibility for accreditation (including laboratory accreditation) by the South African National Accreditation System (SANAS) during 1998, it was decided that a new independent body should be created. The NLA-SA is a non-profit stakeholder body that represents the voice of South African laboratories. Having over 200 organisations who are members they represent the diverse nature of activities within testing and calibration services. The objectives of the National Laboratory Association – South Africa is to become a truly representative association for accredited and non-accredited laboratories. In using the term laboratory this should be recognised in the widest sense and it includes measuring, testing, calibration, verification and other bodies, as well as laboratories which operate in well-defined areas of R&D in the natural and applied sciences. The acronym, NLA-SA, which was linked to the previous National Laboratory Accreditation service was retained, both for the purpose of continuity and because it is well-recognised and respected. 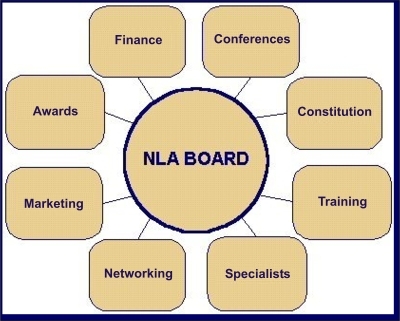 The NLA is a section 21, not for gain company and has a board of directors who are elected from its members. In addition the NMISA, SANAS, SABS Standards Division and NRCS are co-opted onto the board. committees and has his own company, which specializes in metrology and accreditation consulting and training. The NLA-SA’s focus is primarily on the representation of the activities, interests and opinions of all members laboratories. Membership of the Association is voluntary and open to all laboratories. To represent the experience, knowledge and formulated opinions of South African laboratories on a technical, ethical and commercial level. To provide a mechanism for technology transfer among its members by means of workshops, seminars, symposia, specialist interest groups, printed reports and newsletters.